Golf carts, in reality, are not carts, as carts "cannot move under its own power." A golf cart is pragmatically powered by an electric motor or a gas engine. One neat feature of a gas powered golf cart that helps differ it from a regular car is that when one takes their foot off of the gas pedal, the engine turns off. "This feature helps save gas, cuts down on emissions, and helps keep the course quiet, too.” Golf carts also have been primed with electric battery motors that can be charged or even energized by solar panels upon the roofs of the cart (source). A golf cart is an LSV, otherwise known as a Low-Speed Vehicle, ranging from about 20 mph to 25 mph. Compared to other LSV's, there is little difference, as they mostly operate quite similarly. That being said, is it possible to modify golf carts to accelerate faster or pick up higher velocity? It is seemingly possible and simple to do so, however dangerous and unlawful. Insurance companies may deny paying for damages and individuals may risk traffic citation (source). The golf cart was created sometime in the year 1932. However, it wasn't very widely accepted. Not until the 1950s, when the company Marketeer developed the first electric cart designed specifically for golf. At this time, many courses did not allow the carts, some required to have a physician's note to own and operate one, and these golf carts were still fresh and expensive. The industry grew immensely in the 1970s when companies realized they could manufacture golf carts for basic means of transportation elsewhere (source). The penultimate example in central Florida proving this would be The Villages, as more often than not, residents use golf carts to traverse the area, even as far as having mass cart parking spots and driving lanes. What is the magic behind the infamous golf cart and how is it concocted? A golf cart is made with various raw materials and artificial systems. For instance, steel, aluminum, fiberglass, and even wood can make up the body and chassis of the cart. A steering mechanism is implemented for the steering of the vehicle, as well as wheels, suspensions, brakes, and transaxles. There are a number of steps in the manufacturing of the vehicle; “Fabrication of Floor and Body Panels”, “Chassis Construction and Painting”, “Transaxle Subassembly”, “Battery Charger Assembly (Skipped step if run off gas motor)”, “Transaxle and Chassis Assembly”, “Installing Other Components”, and “Fixtures”. After these steps are completed, final touches are added, such as seats, a canopy top, a windshield, and storage baskets. This completes the making of a golf cart, and it is then ready to be purchased and driven (source). It may be taken for granted of the usefulness of any vehicle, let alone a golf cart. 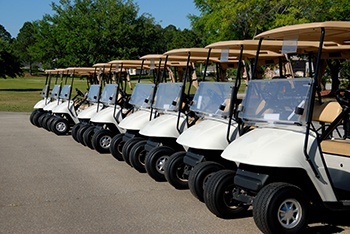 Golf carts are quintessential means of transportation for smaller portions of the area and are extremely affordable for anyone willing to own one. Helped change an old battery, got me back up and running down the road! Great service for a fair price. Thank you Gary and the tall guy for the awesome time consuming job you guys did installing my waaaay overdue new car battery on my old sportage yestetday.. Will spred the word ! !